Pyramid Pro Audio outfits California venue with ShowMatch arrays driven by PowerMatch amplifiers and a ControlSpace processor. 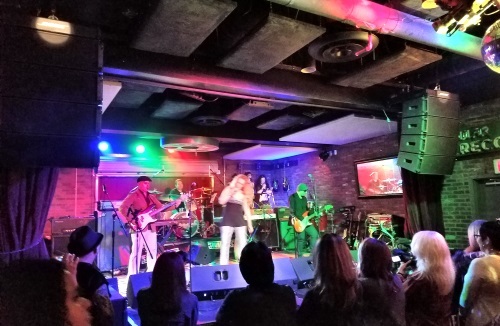 Lucky Strike Live in Los Angeles features a Bose Professional ShowMatch compact line array loudspeaker system. Lucky Strike Entertainment is a 20-location entertainment and hospitality company with trendy bowling lounges. Four years ago, the company began adding live music, locating entertainment stages in several of its locations. Hollywood was the first Lucky Strike Live venue, and it has been outfitted with Bose Professional ShowMatch compact line arrays. Artists including Johnny Depp, Gilby Clarke, Deryck Whibley, Dave Grohl, Phil Anselmo, Jerry Cantrell, Sen Dog, Steve Vai, Nuno Bettencourt, and many others have performed through the Bose concert system. The system comprises two arrays of four ShowMatch modules per side and six ground-stacked SM118 subwoofers supporting a stage that faces out onto several of the venue’s dozen lanes. The system is powered by six Bose PowerMatch PM8500N networked amplifiers and controlled using a ControlSpace ESP-880 processor. The ShowMatch system is joined by backline guitars and amplifiers provided by Friedman Amplification, drums from DW, microphones from Shure and a front of house console from Behringer. Michael Sanders, owner of Los Angeles-based integration firm Pyramid Pro Audio, worked closely with Lucky Strike management to tailor the system to perfectly match the architecture, including the use of Bose Modeler Sound System software. In order to match the architecture around the stage — a wall and a bar at stage left with more open space to the right — Pyramid Pro Audio recommended the use of asymmetrical waveguides (50 degrees on the right side waveguide, 70 degrees on the left, for three SM5 and one SM10 modules per array) on the house right side hang in order to direct audio away from the bar and out towards the listening area. Before ShowMatch, the venue had an older system that first needed to be removed. Sanders then discovered that the existing rigging points were not sufficiently robust to support the new system. “We had to design some hanging points within the Lucky Strike structure and work around the existing electrical. We then ran all new cabling for the system, and installed the entire new ShowMatch system within a few days,” states Sanders. Once installed, they were ready to commission the system, and Sanders recalls the first time they turned it on: “One of the really exciting things was when we first fired up the ShowMatch system. The first song we played was AC/DC’s ‘Back in Black,’ which I am very familiar with, and I could clearly hear the sticks hitting the high hat. That’s when I knew ShowMatch totally impressed me.